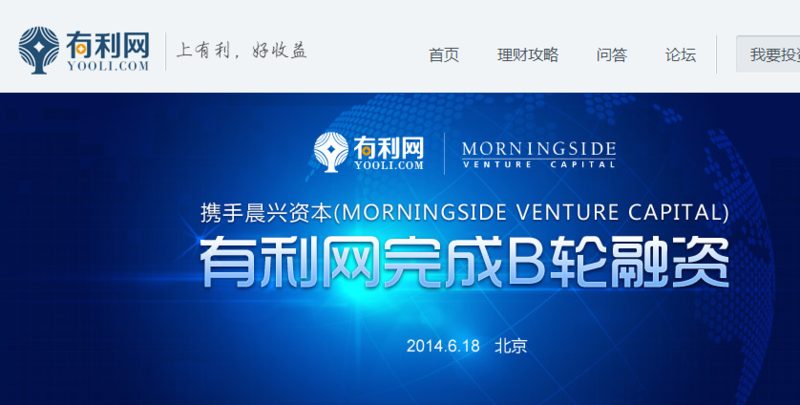 Yooli, a P2P lending platform, announced that it has secured tens of millions of dollars in Series B financing led by Morningside Ventures, which is also the investor ofÂ Â Sohu, Ctrip, Xunlei, UC, Xiaomi and YY. The company has received 10 million of Series A funding from Softbank China Venture Capital last year. The capital will be used in product development, upgrading of IT technologies, risk control and team construction, according to Liu Yannan, CEO of the company. Launched in 2013, Yooli now cooperates with 23 offline micro-credit companies, offering investors access to loans that are originated from many of the smaller P2P platforms. In order to build trust and confidence, Yooli partners with a third party to assess the credit quality of each individual loan. They also partnered with third-party guarantors to ensure that the lenders receive monthly returns. The company claimed more than 760K registered users with a turnover of more than 1.8 billion yuan (around US$290 million). The lack of proper regulations has always been the development bottleneck for P2P industry.Â It is reported that a handful of Chinese P2P sites ran away with an estimated 700 million yuan (over US$110 million) in total in less than half a year.Â Two of most recent fraud cases that stirred up much public attention are Wangwangdai, which absconded with investorsâ money five months after its launch, Beijing-based Wangjinbao and Shenzhen-based Kexun. After witnessing a series fraud cases of P2P sites, Chinese dominant search engine Baidu removed over 800 P2P lending sites from search results for investigation and unveiled P2P lending white list guidelinesÂ in May. The post P2P Lending Platform Yooli Raises Tens of Millions Dollars in Series B Funding appeared first on TechNode. This entry was posted in Funding by Emma Lee. Bookmark the permalink.